How Will Earth's Leaders Respond to a Real Asteroid Threat? An artist's illustration depicts asteroids, or near-Earth objects. Asteroids have pounded Earth in the past and will continue to do so in the future. If a big one lines the planet up in its crosshairs, civilization itself could be imperiled. Now, the United Nations Committee on the Peaceful Uses of Outer Space has taken a step toward combating the asteroid threat. A special U.N. action team on near-Earth objects (NEOs) has recommended the creation of an International Asteroid Warning Network (IAWN), which is designed to gather and analyze NEO data and provide timely warnings to national authorities if a potentially hazardous NEO were to threaten Earth. Secondly, a Space Mission Planning Advisory Group (SMPAG) has been meeting to plan for the possibility of a future asteroid impact. The group includes representatives of spacefaring nations and other pertinent organizations. One key goal of SMPAG is to promote opportunities for international collaboration on research and techniques for asteroid deflection. Once established, IAWN and SMPAG will be independent of the UN and will only inform the UN's Scientific and Technical Subcommittee on a yearly basis on the work that they carry out. While the UN has not taken any bureaucratic steps, the recommendations for an international response to an asteroid impact threat — which are leading to the establishment of IAWN and SMPAG — were made by inter-governmental bodies after years of considering interim reports prepared by Action Team-14, reports by national governments and international organizations and statements and technical presentations made during consideration by the UN's Scientific and Technical Subcommittee regarding NEOs. The meteor that exploded over Chelyabinsk, Russia, in February 2013 served as a wake-up call for politicians and the public that Earth is not immune to asteroid strikes, experts say. And earlier this year, the Committee on the Peaceful Uses of Outer Space (COPUOS) meeting, held June 11-13 in Vienna, was the scene of noteworthy NEO deliberations. "A few more agencies joined, and we can now say that we have all major players in the space scene onboard the SMPAG, so that's great progress," said Detlef Koschny, the European Space Agency's NEO segment manager in the Netherlands. "We have agreed on what to do next," Koschny told Space.com. "Defining criteria on when to start thinking about a possible deflection mission is one of the points. This is not easy." Those criteria include knowing the location of the impact and an estimate of the expected damage. Researchers would also need to determine the minimum number of people who would have to be in danger for a deflection to be warranted. "But these things are hard to know," Koschny said. "They depend on the composition of the object, which often is not known, and needs very precise orbit computations. These are things we have started addressing." As for the IAWN, Koschny said that the major progress is that the relevant people are being made aware that it exists and that they may be part of the network. The first meeting of the steering committee for IAWN took place in January, he said. Taking part in the UN NEO discussions is Tom Jones, a former NASA astronaut and head of the Association of Space Explorers' (ASE) Committee on Near-Earth Objects. ASE — an international professional organization for people who have been to space — produced a seminal report back in 2008 entitled "Asteroid Threats: A Call for Global Response," prepared by the group's International Panel on Asteroid Threat Mitigation. ASE's 2008 report was submitted to COPUOS for consideration and subsequent action by the United Nations. 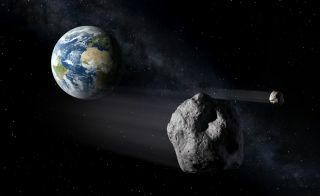 The report's goal was to assist the international community in preventing loss of life and property resulting from an asteroid impact on Earth. "Because NEO impacts represent a global, long-term threat to the collective welfare of humanity, an international program and set of preparatory measures for action should be established," the authors of the 2008 report wrote. In recounting the recent U.N. actions, Jones said that one important development is that NASA has worked with the Pentagon to release space-based observation data from reconnaissance spacecraft that see blazing bolides and fireballs in the Earth's atmosphere. "Nearly 20 events have been posted to date," Jones told Space.com. NASA's Near Earth Object Observation Program is receiving information on bolide/fireball events "based on analysis of data collected by U.S. government sensors," he added. Regarding SMPAG, Jones said the June U.N. meetings were productive, and that the second meeting of the group was attended by 27 space agency representatives and observers. "We heard encouraging news on a number of international NEO exploration missions," Jones said, "some of which include planned demonstrations of NEO-deflection technologies." Jones said he was encouraged by the cooperation displayed at SMPAG to hammer out the "terms of reference" — the operating rules and mission — of SMPAG. Furthermore, there is enthusiasm for future sessions dealing specifically with the planning of a joint deflection demonstration mission, and various supporting research on preventing an asteroid impact, Jones said. "Along with the International Asteroid Warning Network, SMPAG shows that the world's space agencies are serious about understanding the NEO threat, and in sketching out the rough details of how to deal with an impact," Jones said. He's also optimistic about the follow-up steps. "What I hope will come next is the creation of a true joint-mission program to conduct planetary-defense demonstrations, with invitations to all the space agencies to contribute hardware, funding, experiments and firm policy commitments for a launch within 10 years," Jones said. Editor's note: This story was updated on Aug. 14 to include more details on the history behind the International Asteroid Warning Network effort. Leonard David has been reporting on the space industry for more than five decades. He is former director of research for the National Commission on Space and is co-author of Buzz Aldrin's 2013 book "Mission to Mars – My Vision for Space Exploration," published by National Geographic. Follow us @Spacedotcom, Facebook or Google+. Originally published on Space.com.